Commercial premises have always been an easy target for criminals. The sad reality is that with money being so tight for a lot of small business owners, a break-in or senseless act of vandalism can quite easily send them under financially. While it’s vital that companies take every possible step to protect their property, costs will always need to be taken into account. This comprehensive guide explains everything you need to know about palisade fencing and why it tends to be a more popular, cost-effective option when compared with other security fences. What is palisade fencing and where is it used? Although palisade fencing is most commonly found in industrial estates, it can be used anywhere from schools to residential areas. Available in various heights ranging from 1.8 metres to 3 metres, this form of fencing is made from premium-quality, robust steel and is designed to prevent unauthorised access to property. If the vertical pales weren’t intimidating enough to would-be intruders, the triple-pointed tops (which we’ll focus on separately in this guide) will certainly deter them from attempting to scale the fence. What are the main benefits? Reliability First and foremost, it gives small business owners peace of mind that their building, and all the valuable items inside, is well protected at all hours. Because the steel is galvanised, it becomes resistant to corrosion so you don’t have to worry about the long-term effects of adverse weather conditions. Cheaper than many other fencing options Pound-for-pound, palisade fencing is arguably the most cost-effective means of safeguarding your premises 24 hours a day. Because there’s very little maintenance required, you needn’t worry about incurring running costs (as you would if you were to hire a security guard each night, for example). We’ll look at the installation costs, and how they stack up against other options, in more detail a little later in the guide. Easy to install Palisade fencing is very easy to install. It comes in kit form, with clear, uncomplicated assembly instructions included. You’ll find a simple eight-step guide later on. Difficult to climb over As we alluded to in the previous section, criminals will find it exceptionally hard to climb over your fence. Some mesh fences on the market have conveniently-placed (if you’re an intruder) grooves which make for ideal foot holes, while others can be cut open with some heavy-duty pliers. On the other hand, palisade fences offer no support for thieves or vandals who are trying to climb over. There are no horizontal bars low down that enable intruders to shimmy up the fence, and the way in which the vertical pales are spaced out makes it really difficult for even the most daring climber to slide their foot in. Handy for boundary demarcation Once you’ve got your fence in place, everybody will be aware of how much land your business occupies. It’ll stop neighbouring properties from encroaching on to your premises. Manufactured in the UK The ‘Made in Britain’ tag still holds plenty of authority these days, and it’s comforting to know that the components of your fence have been built under strict manufacturing conditions in the UK. Cheap and easy repairs As palisade fences are made from such durable materials, you won’t need to make many repairs at all. That said, a certain amount of wear and tear over the years is inevitable, and if you do need to replace specific components – whether it’s the link plates or just a few nuts and bolts – you’ll find that palisade fence fittings are easy to get hold of. Again, the simplicity of the design works in your favour here, as the fences are easy to put together and maintain. Repair jobs won’t make a significant dent to your company’s finances either. Pales can be bought individually, and this page will give you a better idea of the costs involved. Are there any drawbacks, then? The biggest criticism of palisade fences is the lack of aesthetic appeal. It’s a tricky balance to strike – you want your small business premises to look impenetrable to potential intruders, but you don’t want to put off customers by creating an eyesore. While there are better looking fences on the market, it’s worth noting that palisade fence manufacturers have made their products look a little more visually alluring in recent years. You can get your fence powder coated in a number of different colours, which means you can at least make sure the fence fits in with your company’s branding. Some have also suggested that the width of the pales used in palisade fencing hinders visibility, which can be a security risk (more difficult for surveillance equipment to spot intruders). However, it stands to reason that the bigger and more robust the pales are, the harder it is for criminals to breach your fence. As a business owner, you have to weigh up whether you want a fence that keeps your property secure but is not particularly attractive, or one that looks nice but has clear structural weaknesses. Are there any legal issues to consider when installing palisade fencing? Before erecting any kind of fence, it’s a good idea to check the government’s Planning Portal for any regulations that might apply to you. Generally speaking, you’ll need to apply for planning permission if: Your palisade fence is over two metres tall (6ft 6ins) Your palisade fence is over one metre tall and is next to a road that vehicles use Either the building that you own or a neighbouring property are listed The triple-pointed tops that have become a hallmark of the palisade fence have been known to cause injury in the past (while it’s obvious to most that they shouldn’t attempt to scale such a fence, the owner of the property could still face problems on health and safety grounds if someone does injure themselves). 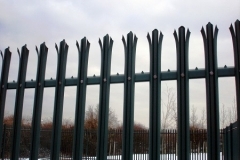 There’s no specific guidance relating to palisade fencing on the Health & Safety Executive website, but nevertheless you might benefit from putting up a few warning signs. Issues relating to the triple-pointed tops are extremely rare, but to avoid any doubt, small business owners can now purchase a palisade fence that has rounded tops. Costs As discussed, palisade fencing is particularly popular because it tends to be the most cost-effective option. The overall price that you pay will depend on a number of variables – most notably the height of your fence and the quality of materials used. For the cheaper range, you’ll be looking at paying: £23.99 per metre for a fence that is 1.8 metres tall £36.50 per metre for a fence that is 3 metres tall This means that a galvanised palisade fence falls somewhere in the middle of the overall fencing market price spectrum. By comparison, V mesh is much cheaper, at around £12.99 per metre for a 1.8-metre-tall fence, but it doesn’t offer anywhere near the same level of protection as palisade fencing. At the other end of the scale, prison mesh is extremely secure. However, with prices starting at £34.50 per metre for a 1.8-metre-tall fence, it is far more expensive than palisade fencing and could well be out of the question for many small businesses with a tight budget. Because replacement parts are so cheap, palisade fencing usually works out as the best option in the long run. If you have got a little more money to spend, you can opt for a heavy-duty version of palisade fencing. It’s worth noting that having your fence powder coated will also cost you extra. How to install palisade fencing Palisade fences really are easy to install. Scorpio steel fencing is delivered in kit form with all of the components pre-drilled, which means you just have to slot it all together. They are sold in 2.75-metre bays (width), with each bay containing: 1 no dig-in fence post 1 no top rail 1 no bottom rail 17 no pales 2 no straight fishplates 34 no pale bolts & security nuts 4 no rail bolts & anti-vandal security sheer nuts The diagrams below show how these components fit together to form your fence. Your simple 8-step installation instructions Before you do anything, it’s imperative that you identify the presence of any underground services. If you suspect that live cables are buried in the area in which you plan to dig, contact an expert. The HSE has extensive guidance on excavation and underground services. Check the length of your palisade fence posts and dig your hole depending on the length that needs to be embedded. Generally, post holes are dug at 2.75-metre centres and need to have vertical sides. The ground conditions will also have an impact on how deep you dig. The following table acts as a handy guide. Fence Height Above Ground Minimum Plan Dimensions Square Holes mm Minimum Plan Dimensions Round Holes mm Less Than 2.4m 350 x 350 450 Diameter 2.4m 350 x 350 450 Diameter 3m 450 x 450 600 Diameter 3.6m 450 x 450 600 Diameter Now you need to mix the concrete for your post foundations. This is also made as simple as possible, as you can use Post Crete. Just mix your concrete with the required amount of water (this will be labelled clearly) and continue to do so until you level out the hole. You need to have your concrete in position before the initial set commences. Erect your posts vertically to the specified depth. Fill the hole to ground level with concrete, which shall be rammed as the filling begins and the top of the concrete weathered. Pass your fishplates through the slots in the posts and join to the Scorpio Rail horizontal using the M12x30 bolts and cone nuts supplied. Fishplates are used to join adjacent horizontal rails. It’s recommended that you tighten all nuts but don’t snap off the security nuts until the line and level is to your liking. Fasten your vertical pales to the horizontal rails using the M8X25 bolts and cone nuts supplied. Don’t do this until the post foundations have set. There should be a 50mm gap between the bottom of the pale and the mean ground level. Once you’re happy with everything, all cone nuts should be snapped off to prevent people tampering with them. Finally, inspect your fence. Has there been any damage to the galvanised coating during the installation process? The components are robust, so you should be fine, but use some suitable touch-up paint to cover any scratched areas.